When your hair turns grey and you’re just happy you still have hair, friends who are younger turn to you and ask for advice. They just assume you’re wiser. That is not true, it’s more you have made more mistakes. Mistakes you can share with them so they can make new mistakes. Some of my advice always has been to not make changes in your personal, professional and work setting all at the same time. Just pick one, leave the rest as is. Hard enough. And then I know one not always has the choice to do so. Life sometimes gives you lemons. A friend of mine had to change on all 3 fronts. Tough situation, and even if I know he is a tough dude, I occasionally check in on him. Just checking if he is alright. Friend from work became personal friend and all. He talked about the new job. Just started, few months in. And he sounded very excited when he talked about a recent experience. As part of a large sales team, he had managed to get his architect certification. They all had it on their todo list as a nice to have. He was the latest addition to the sales team, and he got the certification first. And what really surprised him was the response. The started cheering “ Raising the bar! ”. They all took it as very positive. As yet another incentive to get the certification as well. Celebrate the achievement as key of the team attitude. They will go places. 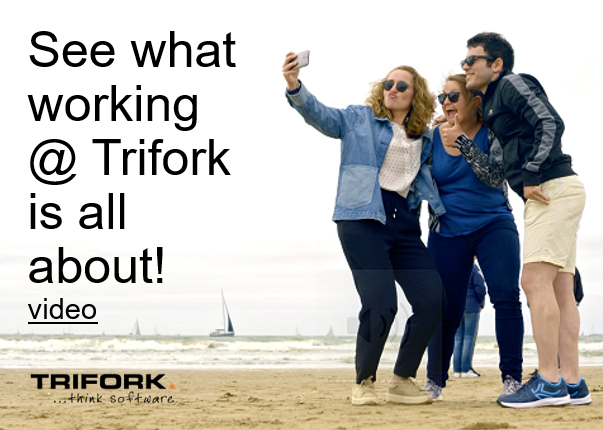 Our brilliant team of Trifork Machine Learning experts presented the next iteration of a new virtual expert they have been working on for the last months. New version each 2 months, one built on top of the previous one. Really seeing it live triggers an enormous amount of new ideas with customers. Collect feedback, get new ideas by seeing it in action. Our sponsor uses the live version to show internally what is possible, to show what the intrinsic value is of all the company data they have. And during those presentations, he is the first with this data-driven approach. First to use machine learning to solve problems in a completely new way, never done before. The presentations also triggers some fun rivalry. Once a company starts to see, live in real demos, built with their own data, what is possible today, they start creating all new ideas. The seeing triggers the ideas. Not the powerpoints, not the sales pitch. Seeing your coworkers solve problems in a completely new way makes you want to do that as well. As one raised the digital bar the rest wants to do the same. The result is that we were asked to do another machine learning project. Same company, different manager, new problem. The first version of the solution already did more than expected. And you know your team has done great when the customer continues discussing after the demo. Discussing about all the new ideas it triggered. And the only problem is they need to have priorities, what new feature to create first. The feature that delivers the most benefit. We call it the 1 to 25 effect. Once the first project is done, in flight, it will have this effect of triggering a multitude of spin-off projects. Other projects that are solely triggered by actually seeing what can be done with their own data and some good old machine learning applied. This experience based digital raising the bar really is fun to see. So many other companies could use this. If only they could make the first step. One of the reasons we do our first project, right after the design thinking phase, small and agile. The sooner they can see the value, however small it may be, the sooner the flywheel starts spinning. The only topic our sponsor wanted to address after the demo was the internal sales part. Everyone from the customer that is part of the machine learning project sees the value. And then there is the large number of people that are working in operations. Trying to keep the boat afloat, keep today’s customers happy. They have no idea what the effect will be on their role, job, security. People that don’t know yet what can be done, and by lack of information make up stories. As people do. So it’s on us explain that as well. Not only do the data-driven business problem solving but also inform the rest of the company. How this is not going to replace jobs. It’s a machine learning virtual expert. Not replacing you but rather taking away the parts of your work that are not to interesting. The time consuming part. How the virtual expert will free up time to work even more customer focussed. Spent time where the fun is. All of this new machine learning driven work is not not meant to have an effect on the bottom line, save cost, less employees. It’s a top-line approach, about customers and continuity. This is about raising the bar collectively as a company.